Members of the Grand River Soccer Club are rallying together to support a fledgling team as it tries to raise the required $3,000 to play in the upcoming season. 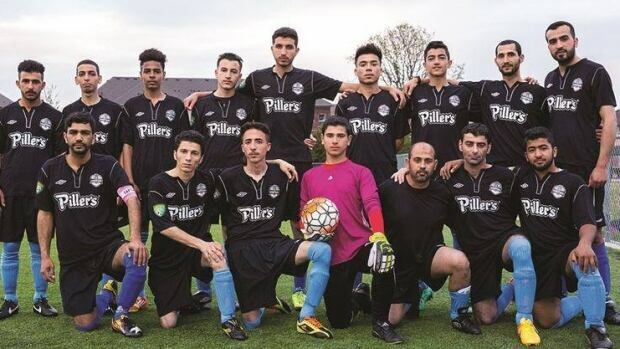 KW Syria United was able to pay for its first season in 2017 with help from Reception House Waterloo Region and other community donors, but now the team needs to find enough money to pay its league fees and other expenses for 2018. “It’s hard,” team member Refaay Alsalem told CBC News. At first, each player contributed some money, but that still wasn’t enough. Most of the members of KW Syria United are refugees who have recently arrived in Canada from Syria and other foreign countries. Alsalem said they don’t have a lot of money to spare. “So, we needed more money,” he said, hence the fundraiser planned for Sunday at Cameron Heights Secondary School. Alsalem’s team will face off against two other teams – Rohingya FC and Grand River Union – in a round robin tournament. Spectators will be encouraged to either donate at the door or online. The tournament was organized by the Waterloo Public Interest Group, a student-led organization run out of the University of Waterloo, and Grand River Union, an organization that promotes soccer culture in Waterloo region. “For me, soccer is one of those things that really helps people integrate,” said Levi Oakey, who is a member of Grand River Union. Oakey said the organization knew about KW Syria United and its financial situation because many members played soccer against them last year on other Grand River teams. He said they wanted to make sure the team had the chance to be on the field again this year. “This is just another opportunity for us to provide an opportunity for them to integrate, to meet other people and to play this game,” he said. The tournament begins at 4:00 p.m. Sunday and runs until 6:30 p.m.